Bored with the same old holiday side dishes of candied yams and sweet potatoes? 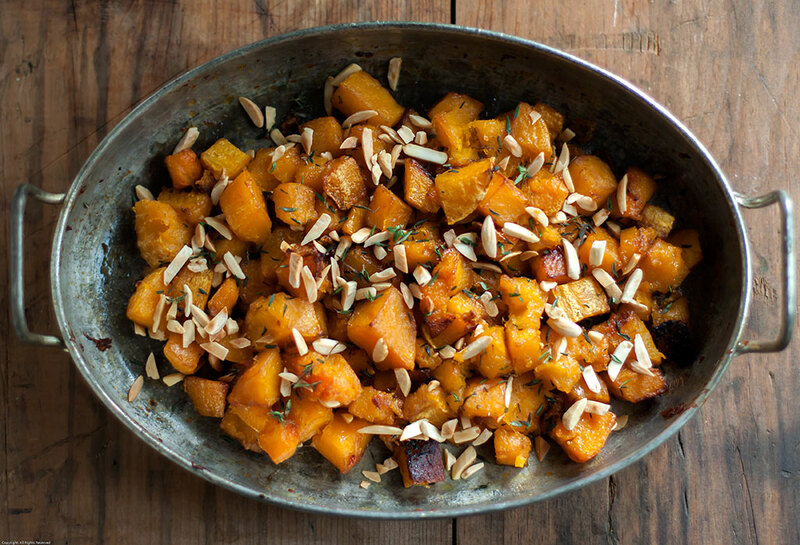 Try something a little less ordinary this year: Roasted Butternut Squash With Truffle Honey, Thyme and Almonds. 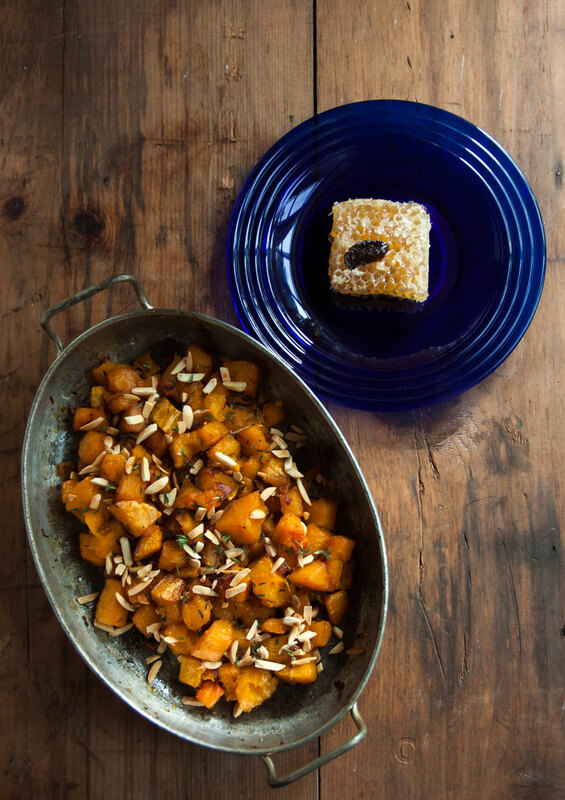 In this easy side dish, butternut squash is roasted until lightly browned and tender, then drizzled with truffle honey and returned to the oven for a few additional minutes of cooking before tossing with toasted slivered almonds. To make things even easier, make this dish ahead of time and reheat it to serve whenever your crowd is hungry. Butternut and other winter squashes have thick skin and dense flesh; it’s easiest – and safest – to use a heavy duty kitchen knife or cleaver to split them. Remove the seeds from the squash the same way you would a Halloween pumpkin – with a large, sturdy spoon. Just use the edge of the spoon to scoop and scrape out the seeds and membrane (you can even roast the seeds, same as pumpkin seeds). Use a coarse sea salt like Fleur de Sel or Maldon Sea Salt to finish this dish; the large grains or flakes will add a burst of salty flavor and an interesting crunch to each sweet-savory bite. There are many fine truffle honeys, any of which will work wonderfully. If you don’t have truffle honey on hand and don’t have time to get some, just use your favorite honey and a few drops of good truffle oil. You can even omit the truffle oil altogether and stick to regular honey, if you prefer. Either way, this dish will win rave reviews from your hungry diners. 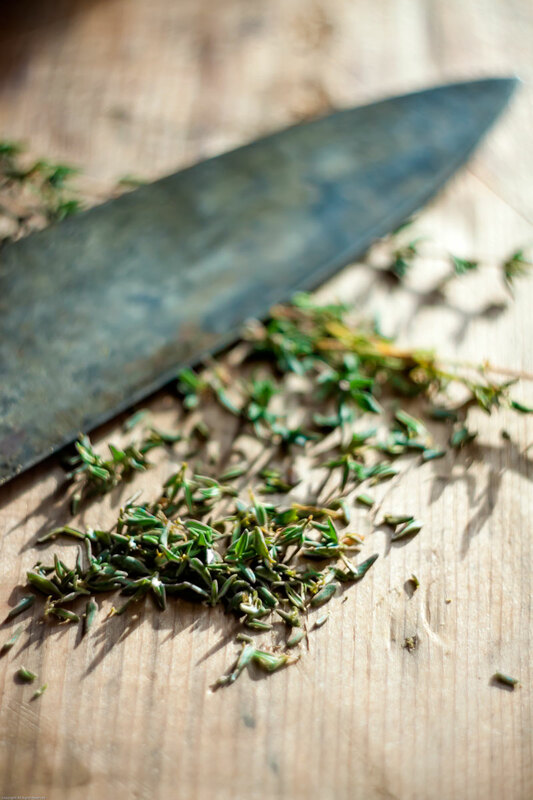 Here’s a handy little trick to quickly remove the tiny thyme leaves from the stems. Hold a knife at a 90-degree angle to the work surface, then scrape the blade along the stems from the base to the tips. The leaves will come right off. Adjust the oven rack to the lower-middle part of the oven and preheat to 450 degrees F.
Toast the slivered almonds in a small, heavy-bottomed pan over medium heat until light golden-brown and fragrant. Tend them carefully – it will seem like the pan is never going to get hot, then the moment you look away, the almonds will scorch. When, they’ve browned to your liking, remove the almonds from the pan and set aside. Cut the squash in half lengthwise with a sturdy knife or cleaver. Scoop out the seeds and membrane from the cavity with the edge of a spoon. Using a vegetable peeler or sharp paring knife, peel the squash, then cut it into 1 inch chunks. 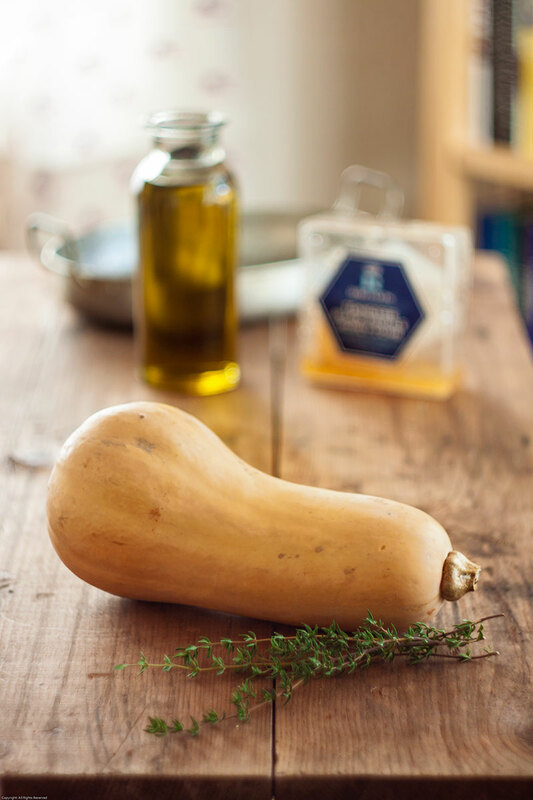 Heap the squash up on a baking sheet, then drizzle with the olive oil and soy sauce. Toss to coat evenly, then spread the chunks out in a single layer. Slip into the preheated oven and roast for 15 minutes, then use a spatula to turn the pieces and roast for another 15 minutes, or until the squash is evenly browned and very tender. Remove the baking sheet from the oven; drizzle the truffle honey over the squash and sprinkle with the thyme. Return to the oven and roast until the honey is bubbly and the squash is fully cooked, about 5 minutes. Remove from the oven and toss with toasted almonds. Spoon into a serving dish and top with a little coarse sea salt. Serve warm.